For anybody that is looking for a party bus in Avon, MI, then your search for a company that you can trust has finally come to an end. Here at Rockstarz Limousine and Party Bus, we specialize in not only providing our clients with an amazing time, but we guarantee that your party is going to be so much better than you could have ever hoped for. When anybody wants to rent a party bus, there are several things that need to be taken into consideration, and one of those things is connected to the number of people that you can invite. For that, we have sought to make the maximum use of the space available on our bus to allow you to invite even more guests than ever before. In addition, we have also added a number of leather seats to allow your guests to rest even as the party continues around them as we want everybody to feel comfortable during their time with us. When you use our Avon party bus service, then we also understand you will be seeking the best atmosphere possible, and we have you covered in that area. Not only have we included an amazing stereo sound system, but there are various lights as well as lasers that just take that atmosphere and ramp things up to a whole new level. 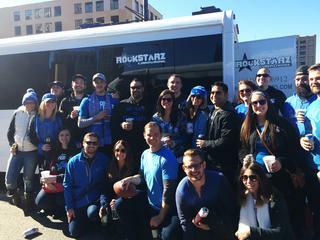 Previously, people have turned to our Avon party bus rental option for a number of different events and occasions. Not only has this included birthday parties, but there are also a range of anniversaries as well as bachelor or bachelorette parties. Of course, perhaps you just want to have a number of friends around for a party with no real reason, and we can also help you out if this is indeed the case. Our aim is to make sure that our clients are all able to enjoy themselves from start to finish. So, if you live in the Avon area and are indeed looking for a party bus that will take things to a whole new level, then contact us today at Rockstarz. As well as calling, you can also contact us via our website where a member of our staff will be happy to help and find out your exact requirements.